Artificial intelligence has a remarkable effect on many different fields with its flexible and comprehensive solution approaches to solve real-world problems. In this context, the field of biomedical engineering has also been affected by employment of different artificial intelligence-based techniques. This chapter aims to give a theoretical discussion on using nature-inspired artificial intelligent techniques for obtaining intelligent applications within biomedical engineering. As it is known, techniques within the field of artificial intelligence are inspired from nature. So, it is a good approach to focus on nature-inspired techniques for discussing intelligent biomedical engineering research works. Readers will have a chance to understand some ways of using artificial intelligence for achieving better results in biomedical engineering and the related developments associated with this field. Many different fields have effective roles on shaping the humankind’s life. Even since ancient eras, humans have had the chance of using knowledge and abilities to change the world and their life, thanks to some discoveries and inventions. In time, specializations have appeared as a result of increasing needs for newer discoveries and inventions. As a result, developments and improvements determining current and future state of the humankind have been performed and classified under different fields. Today, although some main scientific fields like Physics, Chemistry, Mathematics has still great importance in scientific developments, some new specializations formed thanks to combinations of developments in such fields have started to take our interests. It is clear that especially rise of computer and electronic technologies have taken the triggering roles in rapid appearance of newer fields. Today, Artificial Intelligence is one of these fields and it generally has a great importance in developing intelligent systems, which are able to simulate intelligent behaviors shown by humans or other living organisms. Also, considering the current state of Artificial Intelligence, we can say that it is associated with all things in the nature if they have something intelligently used even they belong to lifeless objects. As the future has many alternative scientific fields like Big Data (Mayer-Schonberger & Cukier, 2013; Zikopoulos & Eaton, 2011), Internet of Things (Weber & Weber, 2010; Xia et al., 2012), it is certain that the future of humankind will be based on collaboration of these and many alternative fields. Here, Artificial Intelligence seems to be having a remarkable place with its flexible and effective solution approaches, methods, and techniques for every kind of real-world based problems. When we focus on connections of the Artificial Intelligence with other fields of the modern life, it is possible to see many different research work orientations changing according to structure of different fields. Especially applied fields have great potential to employ intelligent solutions designed over techniques of Artificial Intelligence. In detail, engineering oriented fields are important to be considered in this manner. Currently, the field of Biomedical Engineering is one of the trendiest fields in which intelligent solution approaches are widely used. Dealing with the applications of engineering oriented studies within medical and biology to solve healthcare problems (Bronzino, 1999; Bronzino & Peterson, 2014; Enderle & Bronzino, 2012), Biomedical Engineering is an important field needing support from innovative solution ways and the field of Artificial Intelligence has done that easily according to the latest developments done so far. This situation can be also a result of instant needs for effective solutions for healthcare services and solutions done on the background. Because studies associated with Artificial Intelligence has proved the role of intelligent solution mechanisms for solving problems of even the most complicated fields have always resulted in successful and effective outputs at the end, popularity of Artificial Intelligence based applications in Biomedical Engineering has increased day by day. At this point, it would be a good way to improve awareness among anyone, who are interested in employment of intelligent solutions for Biomedical Engineering problems. In this chapter, it is aimed to give a theoretical discussion on using nature-inspired Artificial Intelligent techniques for obtaining intelligent applications within Biomedical Engineering. As it is known, techniques appeared within the field of Artificial Intelligence are inspired from the nature. So, it is a good approach to focus on nature-inspired techniques for discussing about intelligent Biomedical Engineering research works. In detail of this chapter, the readers will have a chance to understand some ways of running Artificial Intelligence for achieving better results in Biomedical Engineering and the related developments associated with this field. 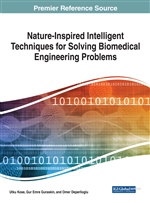 From a general perspective, the chapter has written as a starting reference for the works focused on intelligent solutions for Biomedical Engineering problems.